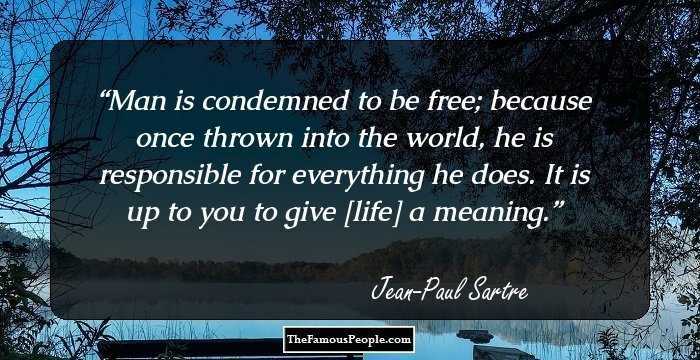 Quotes by Jean-Paul Sartre on existentialism, leadership, God, truth, existence and other things. 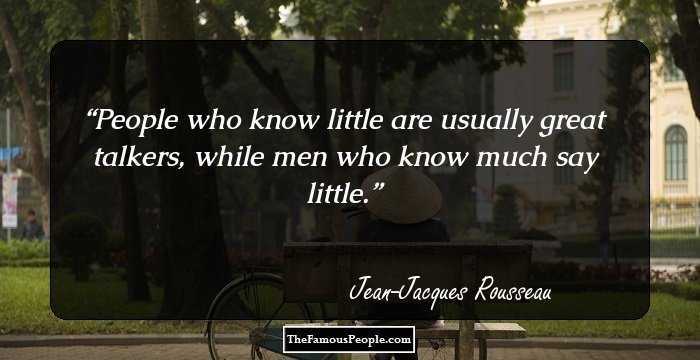 Jean-Paul Sartre was a French novelist, political thinker, activist, philosopher and playwright, who is considered among the finest intellectuals to have ever lived. 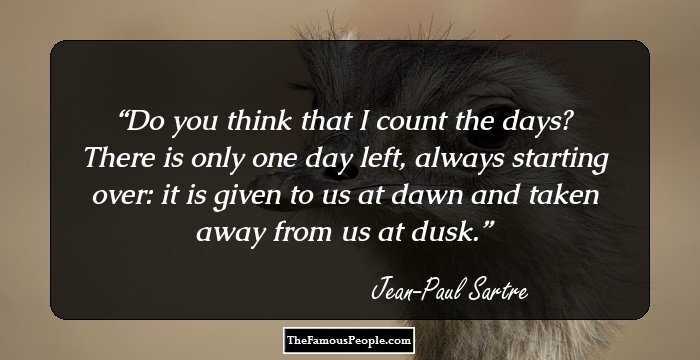 Sartre was among the leading thinkers of the 20th century and is considered to be one of the most ardent advocates of Marxism. 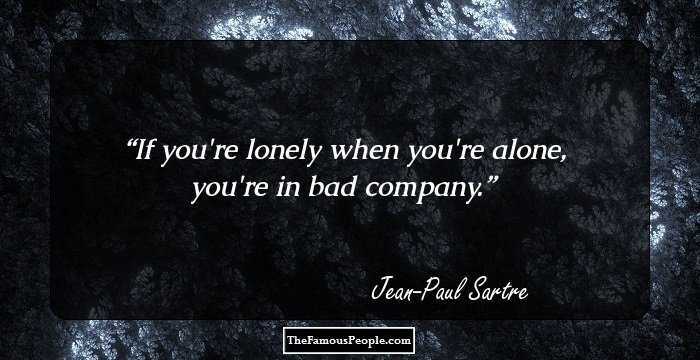 On the other hand, Sartre is well and truly one of the real pillars of French philosophy in the 20th century and is famous for laying the foundations of the philosophy of existentialism. 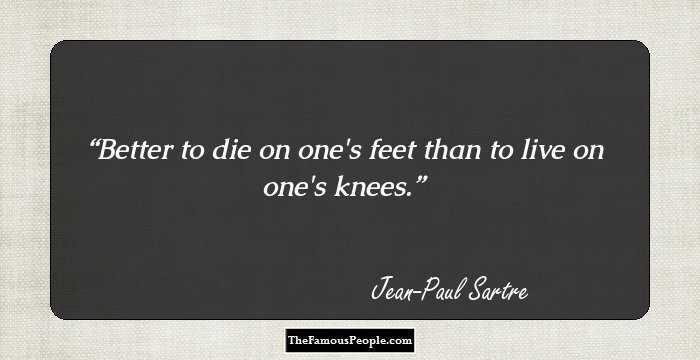 Sartre was a multi-faceted thinker. 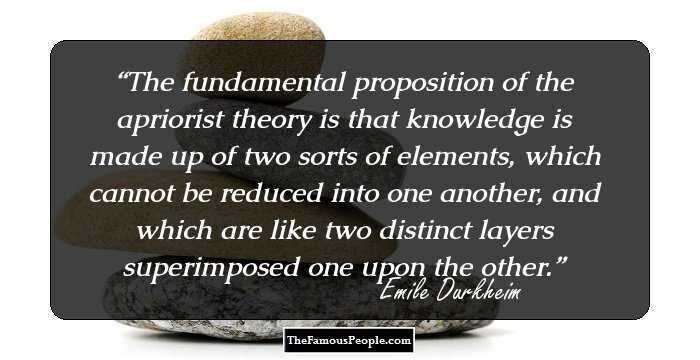 One of his most famous works is the book ‘Being and Nothingness’ which he wrote in 1943, however the print version of his lecture ‘Existensialism and Humanism’ is perhaps his most famous work till date. 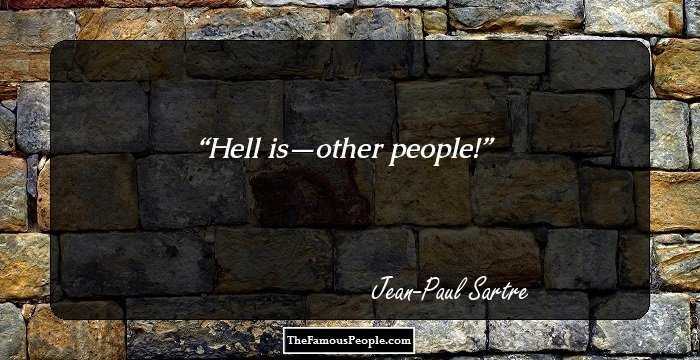 Other than existentialism, Sartre also laid the foundations of continental philosophy, phenomenology, anarchism and existential phenomenology among others. Jean Paul Sartre’s immense body of work eventually won him a Nobel Prize in Literature in 1964 but he refused the award. 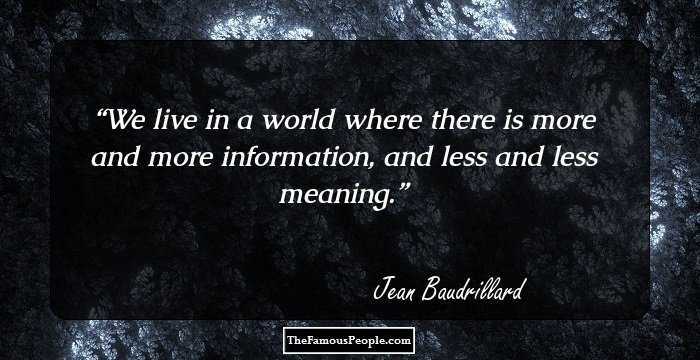 Here are some of the greatest quotes by this great intellectual. 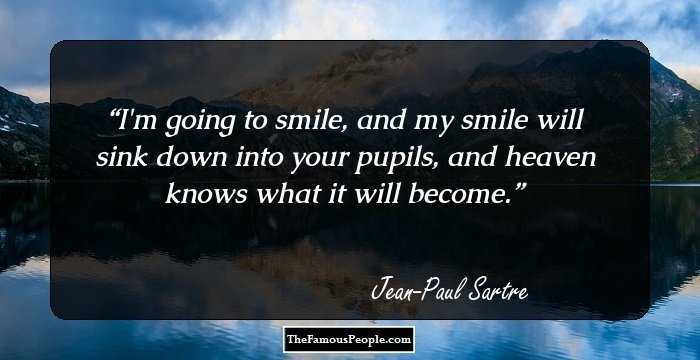 I'm going to smile, and my smile will sink down into your pupils, and heaven knows what it will become. You are -- your life, and nothing else. She believed in nothing. Only her scepticism kept her from being an atheist. All that I know about my life, it seems, I have learned in books. Like all dreamers I confuse disenchantment with truth. Life has no meaning a priori… It is up to you to give it a meaning, and value is nothing but the meaning that you choose. Ha! to forget. How childish! I feel you in my bones. Your silence screams in my ears. You may nail your mouth shut, you may cut out your tongue, can you keep yourself from existing? Will you stop your thoughts. Smooth and smiling faces everywhere, but ruin in their eyes. It is therefore senseless to think of complaining since nothing foreign has decided what we feel, what we live, or what we are. I am going to outlive myself. Eat, sleep, sleep, eat. Exist slowly, softly, like these trees, like a puddle of water, like the red bench in the streetcar. It answers the question that was tormenting you: my love, you are not 'one thing in my life' - not even the most important - because my life no longer belongs to me because...you are always me. Man is what he wills himself to be. I am. I am, I exist, I think, therefore I am; I am because I think, why do I think? I don't want to think any more, I am because I think that I don't want to be, I think that I . . . because . . . ugh! She smiled and said with an ecstatic air: "It shines like a little diamond", "What does?" "This moment. It is round, it hangs in empty space like a little diamond; I am eternal. Through the lack of attaching myself to words, my thoughts remain nebulous most of the time. They sketch vague, pleasant shapes and then are swallowed up; I forget them almost immediately. You must be like me; you must suffer in rhythm. Nothing happens while you live. The scenery changes, people come in and go out, that's all. There are no beginnings. Days are tacked on to days without rhyme or reason, an interminable, monotonous addition. People who live in society have learnt how to see themselves, in mirrors, as they appear to their friends. I have no friends: is that why my flesh is so naked? I had found my religion: nothing seemed more important to me than a book. I saw the library as a temple. Better a good journalist than a poor assassin. Man is condemned to be free. Condemned because he did not create himself, yet is nevertheless at liberty, and from the moment he is thrown into this world he is responsible for everything he does. One always dies too soon — or too late. And yet one’s whole life is complete at that moment, with a line drawn neatly under it, ready for the summing up. You are — your life, and nothing else. As for me, I am mean: that means that I need the suffering of others to exist. A flame. A flame in their hearts. When I am all alone, I am extinguished. I found the human heart empty and insipid everywhere except in books. There is a universe behind and before him. And the day is approaching when closing the last book on the last shelf on the far left; he will say to himself, "now what? Little flashes of sun on the surface of a cold, dark sea. Nothingness lies coiled in the heart of being - like a worm. I exist. It is soft, so soft, so slow. 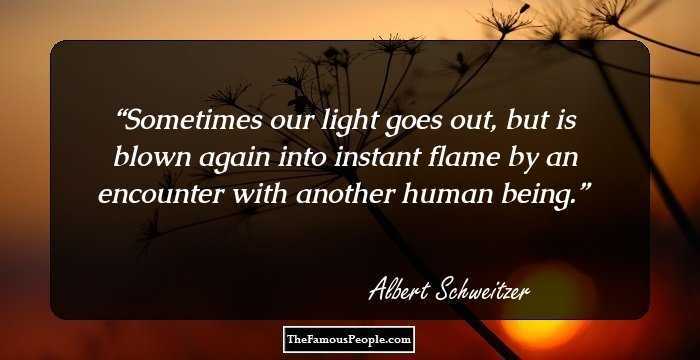 And light: it seems as though it suspends in the air. It moves. I never could bear the idea of anyone's expecting something from me. It always made me want to do just the opposite. Perhaps its inevitable, perhaps one has to choose between being nothing at all and impersonating what one is. I am myself and I am here. I wanted my own words. But the ones I use have been dragged through I don't know how many consciences. The aim of language...is to communicate...to impart to others the results one has obtained...As I talk, I reveal the situation...I reveal it to myself and to others in order to change it. I'd come to realize that all our troubles spring from our failure to use plain, clear-cut language. Anything, anything would be better than this agony of mind, this creeping pain that gnaws and fumbles and caresses one and never hurts quite enough. I’ve dropped out of their hearts like a little sparrow fallen from its nest. So gather me up, dear, fold me to your heart – and you’ll see how nice I can be. He is always becoming, and if it were not for the contingency of death, he would never end. One could only damage oneself through the harm one did to others. One could never get directly at oneself. I can receive nothing more from these tragic solitudes than a little empty purity. An individual chooses and makes himself. Once freedom lights its beacon in man's heart, the gods are powerless against him. 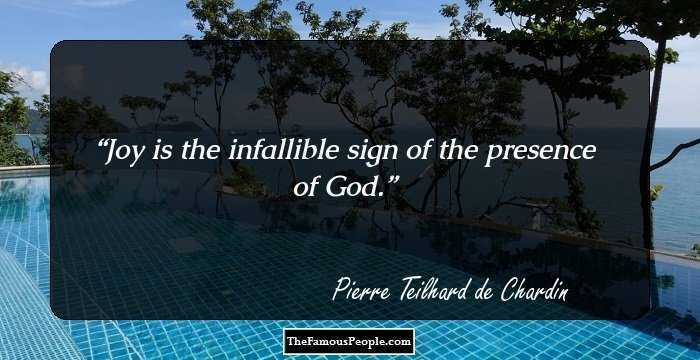 All men are Prophets or else God does not exist. The consciousness that says 'I am' is not the consciousness that thinks. It is disgusting -- Why must we have bodies? A pale reflection of myself wavers in my consciousness...and suddenly the “I” pales, pales, and fades out. I think that is the big danger in keeping a diary: you exaggerate everything. What do we mean by saying that existence precedes essence? We mean that man first of all exists, encounters himself, surges up in the world-and defines himself afterward.